Happening with Carrier, Lambert, Côté, Neumann and guest Mat Maneri. Recorded Live at GESÙ in Montreal on April 8, 2005. Listeners who have followed multiple reed player François Carrier, particularly his two 2004 releases Play (482 Music) and Traveling Lights(Justin Time), will welcome this double-CD offering on Leo. Not only is Happening a double dose of outstanding freely improvised (as opposed to “free”) jazz, but it is recorded live. Carrier’s long-time trio partners Pierre Cote (bass) and Michel Lambert (drums) join him, plus Mat Maneri on viola and Uwe Neumann on various Indian instruments, including sitar and anandolohori (Indian talking drum). Anyone who’s not familiar with the language of free improvisation may find Happening a very good place to get their feet wet: the music has extraordinary coherence and developmental logic, played out in real time. One player will present and develop a motive or theme, which is then taken up by another; or an interjection will be picked up and developed as a new theme; or a clear pulse will naturally emerge out of the mist. Everyone involved is quite secure and skilled at this kind of thing; indeed, the core trio has been doing it for years. Much is made in the notes of the Indian instruments, microtones, modal music and the convergence of Western and Eastern musical aesthetics. This music most definitely is not a mix of those traditions like Samita Sinha’s Seep or Sunny Jain’s on Avaaz—or, for that matter, Vijay Iyer and Rudresh Mahanthappa’s duo work on Raw Materials. Yes, the sitar plays in the (Western) cracks, and yes, microtonal playing is quite natural to Mat Maneri (in part through his father Joe), and finally, yes, there is no tempered instrument like a piano present. Also, while the music most definitely feels modal in that there is an anchor note supporting some kind of scale, the rhythms, when they are present, are not Indian, and the entire improvisational approach, including phrasing, is most definitely Western. Thus, to these ears, the sitar sounds a bit forced, or at least grafted onto what music that otherwise feels very natural. That said, this music is exquisitely exciting. Carrier, playing both alto and soprano saxophones, both leads and follows, spinning long, unpredictable lines. With and against him, Maneri plays the most Western (and classical) instrument, constantly pushing and pulling everyone else. Cote and Lambert can be heard sensing what is happening and supporting it, while also occasionally taking charge. Listening to Happening is like being a member of the audience during its recording, and the experience is highly recommended. Québécois saxophonist Carrier is a new name to me, but he’s assembled a very quirky, provocative group of instrumentalists. Supplementing his long-standing trio are the ever resourceful Maneri and multi-instrumentalist Neumann. Carrier is a patient. lyrical player, not dissimilar in some sense from Steve Lacy in terms of his approach to line and melody. This makes for an interesting element in music that almost pools at the edges of your listening, its ephemeral forms slowly condensing into liquid ensemble passages that aren’t easily contained. Maneri’s singular voice, of course, contributes greatly to this effect and he’s as dazzling as ever. Because the sound is a bit boomy, however, some of Lambert’s details get a bit lost (though he and Côté have a fine duo passage early in the concert). These pieces take their time unfolding and obviously touch down on a great many different ideas. The strongest pieces are those which comprise the first disc, with patient rhythmic explorations establishing a foundation for Carrier’s somewhat gruff, grainy alto. 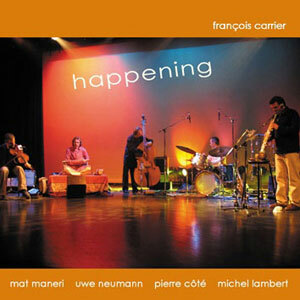 On the long opening “happening (one)” he pushes forward, with Maneri’s aid, into a gentle trot that catalyzes some excellent work from all considered. Neumann waits almost 25 minutes before his entrance. Sitar is a difficult instrument to incorporate into these kinds of settings because it’s so idiomatic and more or less forces the ensemble into a particular mode of playing – the trick, then, is responding creatively, which in general these players do. After the muscular swing of “happening (two)” and the intense snake-charming effect of “happening (three),” the two long pieces that comprise the second disc seem considerably lighter, at times even glowing with an idyllic pastoral feel. Neumann’s sanza meditations certainly contribute to this effect, and the music eventually works itself into a fine froth that sounds situated at the intersection of a mid-1970s Carlos Ward jam, the Die Like a Dog trio, and Codona. The Carrier/Maneri interaction is very nice, but while Maneri dazzles when he steps to the forefront and Neumann’s effective are occasionally entrancing, the trio’s basic empathy is ultimately what accounts for the success of this music.